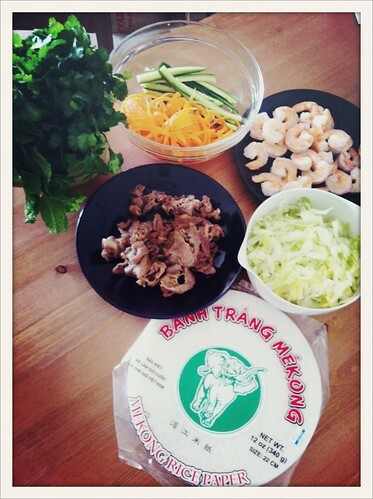 I'll be honest, these spring rolls are kind of a pain to make. 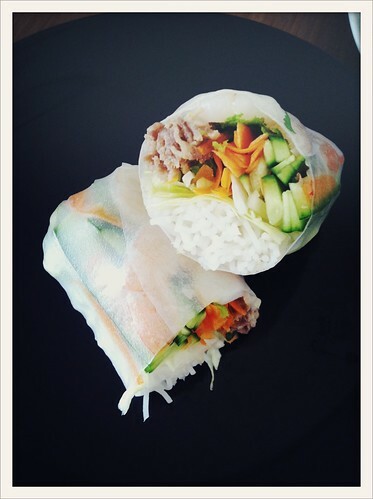 The thin rice paper wrappers are a nightmare if you've never worked with them before. The results, however, are quite rewarding--especially on a warm summer day. 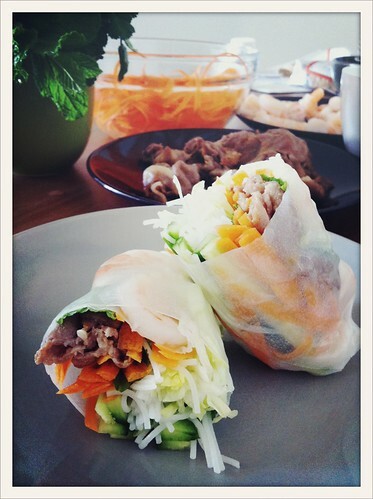 Light and refreshing, I like to think these spring rolls are relatively healthy. I realize it's not exactly summer yet, but these things ARE called spring rolls for a reason, so this was how I spent my Monday afternoon. 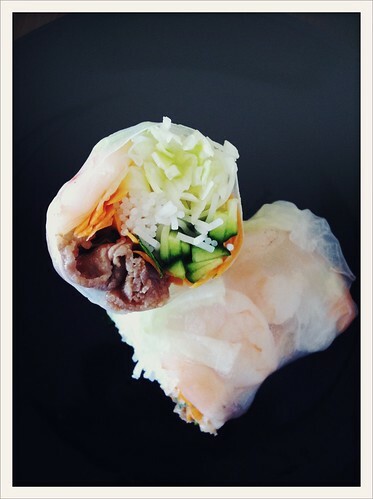 I love all the colors in this spring roll. I especially love cutting them in half after carefully rolling them up. That cross section is what I live for. Here's a short list of my ingredients. Go crazy. DO NOT OVER WET IT! It may look like it's still hard, but trust me, a quick dip in warm water is all it needs. I just put a little bit of water at the bottom of a flat plate, and lay the wrapper on the water briefly on both sides. It will soften up some more while you put all the ingredients in their place. By the time you're ready to roll it up, it'll be ready to go. Koreans love having spring roll parties. It's something that middle aged korean moms do when they want to feel like they're not eating too much. Looks good! Total guilt-free food. Were these all taken with iphone? Wow, those look really great. Makes me want to make some of my own. In fact, I will. YUM! always wanted to make these... great post!